As a scuba diver I have never once heard of a diver causing a boat accident. I think he meant divers would come across the guns on the bottom. Turn up the sarc meter mon capitaine. I had to throw all my guns out of my plane to lighten the load when I was flying over the Gulf. Waaay out at sea far too deep for divers. So tragic. All I have left is this rusty old .38, but yes, here it is officer, I'll be happy to turn it in to confiscation police. Sorry officer, but those nasty fire ants done toted off all my collection. Sorry officer, but my guns all fell down that drought crack in the old gumbo soil there and plumb disappeared forever. Sorry officer, I had a garage sale and sold them all to some dude with a heavy accent named Chapo Guzman. Should things reach a point where officers are confiscating guns from otherwise law-abiding citizens, I'd suspect that nothing you could say ( including, "I sold them to someone who can legally own guns") would prevent your home from being searched. 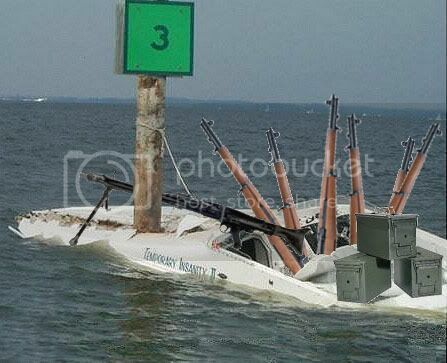 "I lost my guns in a boating accident" is another way to say, "I'll be giving you my guns (bullets first! ), when you aren't surrounded by other armed officers and driving a tank." The fact that so many people expect that day to come in the US, in their own lifetimes -should be a lot more disturbing than how "unlikely" the boating accident scenario is to occur. Lots of otherwise sane people are scared of their own government and the police forces they (theoretically) control. Seems like the government is scared of an armed populace. They should be and this is the reason for an armed militia.